The Gauntlet contrasts the lives of Zach Taylor—a married financial consultant on the verge of bankruptcy—and Sammy Biddle, a widowed church custodian tormented by flashbacks of the Vietnam War. Bound by fate, Zach and Sammy cross paths in the Nation’s Capital when Zach resorts to selling drugs in a desperate attempt to bail out his wife, Jenny, from an unjust run-in with the law. With time running out, Zach learns hard lessons about friends and money as a violent confrontation with an unexpected twist leaves Zach and Jenny in the hands of a dubious ally. 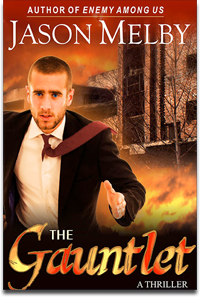 The Gauntlet is available at Amazon, Barnes & Noble, Apple, and other major retailers.